Photos via Burial Beer Co. Drink Features Burial Beer Co.
Asheville’s Burial Beer Co. wears a fairly heavy crown, these days. It’s no secret that since the acquisition of Wicked Weed by Anheuser-Busch InBev in the spring of 2017, a lot more attention has turned toward one of North Carolina’s other most sought-after breweries. It’s also no secret that many beer geeks had already considered Burial to be “the best” brewery in Asheville even before the buyout was announced, with their relatively smaller size and grittier aesthetic helping to add street cred when compared to the shine and polish of the larger Wicked Weed. Living in Atlanta, I’ve seen the brand’s popularity swell firsthand, as cans of Surf Wax IPA or Skillet Donut Stout have been greedily snatched up off store shelves around me since they were introduced to the market. They’ve also performed well in Paste’s monthly series of blind style tastings, even taking home #1 in our blind tasting of 116 saisons back in June. Recently, while making a weekend swing up through Asheville with friends, my path crossed with Burial once again. The last time I stepped into the small space, just a handful of yards from other classic Asheville breweries such as Green Man, it was 2015 and the brand still felt like a new kid on the block. 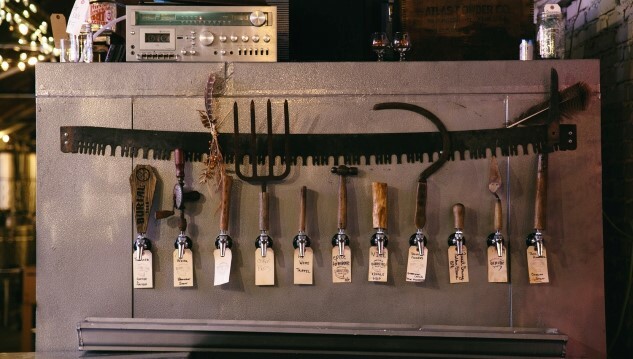 This has since visibly changed—with yet another new generation of Asheville breweries on the rise, Burial is now a savvy veteran of the scene. The original taproom location has now become the experimental lab of head brewer Timothy Ryan Gormley, with the larger-scale brewing happening at a second production brewery off-site. But there’s plenty that hasn’t changed—it’s still crowded; the beer is still good; there’s still plenty of inexplicable (unless you inquire) Tom Selleck tributes wherever you look. As my group stopped by Burial on a weekend afternoon, I pulled Gormley (a co-founder, alongside Doug and Jess Reiser) aside for a quick conversation on beer styles, beer philosophy and Burial’s unique aesthetic, along with the evolution of the Asheville beer scene following the purchase of Wicked Weed. It follows below. Paste: The Burial philosophy toward the brewing program as a whole; is that primarily a product of your whim or a combination of you, Jess and Doug? Gormley: I think it was definitely a combo of the three of us; we all added different elements to what the culture and visual aesthetic of Burial is, and what kind of beers we make. Paste: By the way, let me just say that as a horror geek, I appreciate the sheer amount of death and gore so often found on your labels. Gormley: Laughs Yeah, that’s true. It ties in nicely with our brewery name of course, but it’s mostly from the mind of our artist David Paul Seymour, who has been working in the metal and psych rock music industry for a long time. I think we’re his first non-music client, so he’s used to making a lot of album covers. Paste: You just don’t expect to see a decomposing rabbit on a can of pilsner, ya know? Gormley: That was one of the first labels we ever did (Shadowclock Pilsner) with what we call the “light side and the dark side” of the can, where it’s clearly meant to be the same image where time has passed. The rabbit does not age well. The grisly label in question. Paste: So, there’s a lot of breweries that do a bunch of IPAs, or a bunch of stout, or a bunch of saison, but you guys sort of specialize in those three things at once—that’s how I think of the Burial beer lineup, anyway. Why those three? Because it seems to me if you’re making a Deathly Hallows-sort of insignia, those would be three good representations of American craft beer. Gormley: Well, when we first opened it was a goal to approach as many different styles as we could, and at this point I think we’ve made about 750-plus batches since we opened, and probably a couple hundred unique beers. We’ve approached almost every style you could think of, but ultimately we fell into making the beers that we collectively as a trio love to drink the most. Also, I’d be lying if I said part of it wasn’t a matter of brewing the types of beers that the beer geeks in the audience get excited about. Paste: So with that said, what do you love about saison, IPA, stout, etc, in the style that you make them? Gormley: Okay, so ever since I got into beer I fell in love with Belgian styles. In 2010, we took this research trip to Belgium, The Netherlands, France and Germany, and we became sort of obsessed with the concept and history of farmhouse ales in the Belgian style. We love Belgian styles across the board and make them all, but saisons especially speak to us because of the romantic history, I think … the whole concept of brewing on the farmhouse and using what you have available to you. I think that style has the most capability of being extremely diverse and adaptable. I love to drink them, and I love to brew them. With all of the different substyles we can do with mixed cultures and wild yeast and blending, I don’t see how you could ever get tired of saison. As far as stouts go, we really try to make stouts year round, which is a little bit unique. I think in a lot of ways stout is the exact opposite of saison, which is typically very dry and effervescent and earthy, where your stout is probably going to be sweet, roasty and big-bodied. It’s a time-and-place sort of style—when I’m in the mood for stout, it feels like it’s everything I could ever want. And of course I love being able to play around with barrel-aging stouts, using adjuncts and finding inspirations in various decadent desserts, or using fruits … there’s more variety in stout than people realize. As for IPA, I’d be remiss if I didn’t say that Doug is the champion of IPA here. He pretty much writes all the recipes for the IPAs. I enjoy them from time to time, but they’re not really my thing to be honest. But Doug loves to experiment with them and has been doing a series of DIPAs this whole calendar year, a new recipe every month, which has been a fun challenge for him. Paste: I think perhaps Surf Wax is your crown jewel, as far as those are concerned. Gormley: Yeah, that’s about as close to a flagship as we come to. We make more of it than any other beer at this point; it’s been very good to us. Paste: What was it like in this Asheville beer community in the wake of the AB InBev buyout of Wicked Weed, and how do you feel about sort of inheriting the title as one of the town’s critical darlings? Gormley: I’m full of mixed emotions when it comes to that. Obviously, if you were in Asheville prior to the buyout of Wicked Weed you’d know that we were very, very close. And from a personal level we’re still close. We started close to the same time, and were two of the first breweries to embrace Belgian styles in town. We bonded over that, and we had a ton of respect for how diverse and stellar their lineup has been. We leaned on them a lot if we needed ingredients or barrels, or things like that, and they always helped us out. So when that news came out, it was kind of a crushing blow to us. We struggled with how to deal with it, not only as people but as a company. And I think we tried our best to kind of separate those two things. From a company standpoint, we disagree with that concept of selling out to a company that is in a lot of ways trying to put people like us out of business, but from a personal standpoint we’re not going to say “Hey, we don’t like you as people anymore.” For 99% of them, they didn’t have anything to do with the decision. From what I hear, a lot of locals don’t go there as much anymore, but the tourists may not care, and that’s fine. I don’t find myself drinking there anymore, but I still see and talk to the guys who work there. They have an absolutely amazing wealth of knowledge. Jim Vorel is a Paste staff writer and resident beer guru. You can follow him on Twitter for much more beer content, including Paste’s blind tasting series.